My first Starbucks love was their classic Chai latte. Ignore the new one that came out a couple years ago with Oprah, and just focus on the original Chai latte. It’s creamy, spicy, bursting with great flavour and it’s also expensive after a while. At over $4 a cup (I usually get grande), I always wanted to be able to make it at home without having to fork over nearly $5 for every cup. The Chai Latte Concentrate is not a product that I’m new to, it’s something that I buy on occasion because it’s definitely cheaper and more budget friendly to buy the carton of tea concentrate than it is to pop into a Starbucks location every single time that I want a Chai latte. 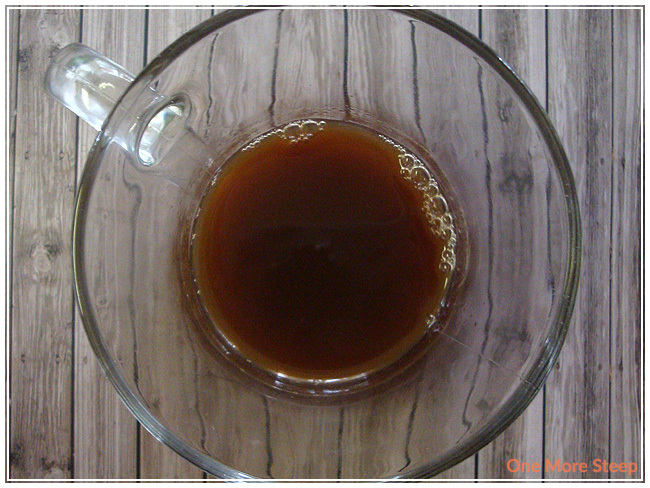 The tea concentrate is a dark, almost murky reddish brown colour. The aroma of the Chai Latte Concentrate is all of the familiar spices that you would expect to find in a Chai: cloves, cardamom, cinnamon. It also smells like it is very, very sweet. Deliciousness in a cup! The ingredients for the tea concentrate are as follows: water, black tea, black pepper, ginger, cardamom, cinnamon, cloves, star anise, natural flavours, cane sugar, honey, ginger juice, natural flavours, vanilla extract, and citric acid. Everything from water to the first natural flavours is the infusion, and then the added ingredients after it. Cane sugar and honey would account for the very, very sweet aroma and taste to the tea concentrate. The directions on the carton from Tazo Tea is to shake the carton and then mix equal parts of the concentrate with milk (or dairy alternative of your choice). It can be served over ice, heated on a stove, or heated in a microwave. I mixed half a cup of tea concentrate with half a cup of 1% milk and heated it in the microwave. 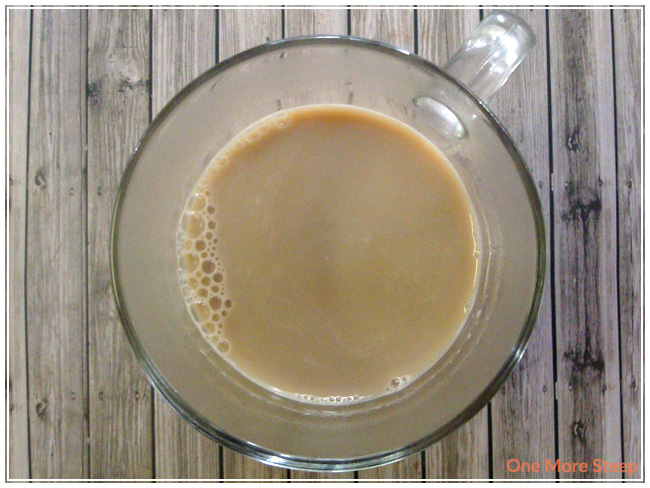 The colour of the Chai latte after it was done in the microwave (and I gave it a little stir) is a pleasant light brown colour that is very similar to the colouring of a Chai latte made in a Starbucks, if not the same. I had to let mine cool for a bit since it was too hot to sip coming from the microwave. While I don’t get the foam that I often have on top of my lattes that I get from Starbucks or other cafes, it’s quite good. If you’re not fond of sweet things, this product will probably not be for you (and perhaps making your own tea concentrate would be something you could try in the future). I personally really enjoy Chai lattes, so I really like the flavour of this tea concentrate. It definitely has the spice and heat that I would expect from a Chai (thanks to all that ginger! ), the flavours of cinnamon really come out well and the creaminess that the milk adds really helps to cool down some of that heat. 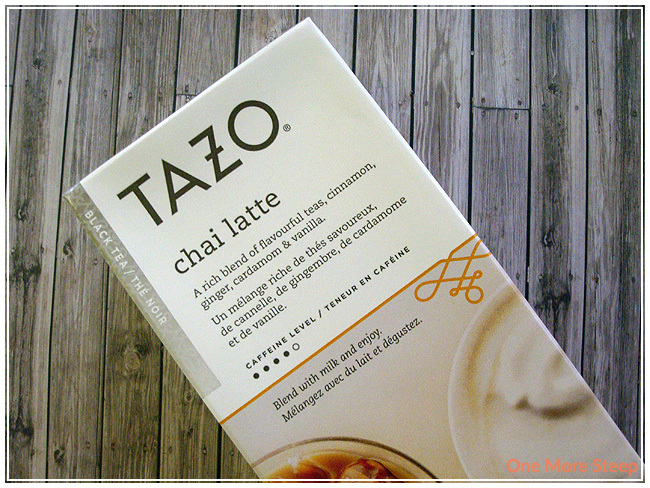 I loved Tazo Tea’s Chai Latte Concentrate. As I previously mentioned, this was not my first time having this product (and it certainly will not be my last!). I find it really nice to be able to have my favourite ‘treat’ (a Chai latte) without having to spend the money in the local Starbucks. The unused portion of the carton keeps for up to 7 days in the fridge after opening, and for someone who really enjoys Chai lattes, it is cheaper to go with the carton of tea concentrate than it is to get it made in-store. That said, it would be even cheaper to just make my own Chai lattes from scratch (I know, I know), but for a quick, pretty fool-proof latte, this tea concentrate works really well as a nice treat from time to time.